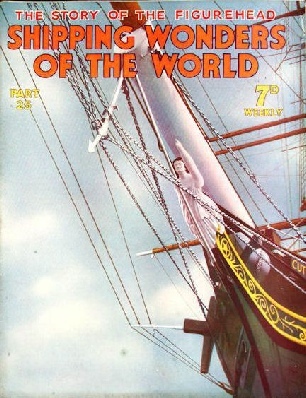 Part 25 of Shipping Wonders of the World was published on Tuesday 28th July 1936. 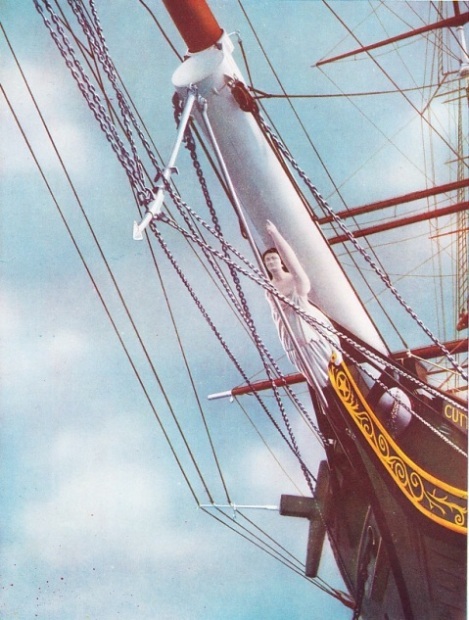 This issue included a colour plate illustrating the figurehead of the Cutty Sark, the same illustration appeared as the cover. The colour plate accompanied an article on Ships’ Figureheads. The plate was attached to page 781 of this issue. The chapter on ships’ figureheads is illustrated with a beautiful colour plate (also reproduced on the cover of this week’s Part) showing the figurehead of the Cutty Sark. The introduction of wireless telegraphy in ships has solved the problem of ship-to-ship signalling over long distances. Many interesting methods were formerly used in sailing ships and steamers. Few things could have been more complicated and clumsy than some of the methods of signalling at long ranges which were provided for ships in the preceding years. This chapter was written by Commander Hilary P Mead. THE FIGUREHEAD OF THE FAMOUS CUTTY SARK represents the figure of Nanny the Witch. A contemporary ship, the Tweed, belonging to the same owner, had a figurehead of Tam o’ Shanter. For some years the Cutty Sark has been preserved in Falmouth Harbour, Cornwall. A clipper ship with a displacement of 1,970 tons and a gross tonnage of 963, the Cutty Sark had an iron frame planked with wood. She was launched at Dumbarton on the Clyde in 1870 for Captain John Willis. In 1875-76 she raced against her rival clipper, the famous Thermopylae, from London to Australia. She lost the race on the outward journey by seven days, but arrived home seventeen days before the Thermoplyae. The chapter beginning on page 47 tells the story of these famous clipper ships. The Cutty Sark was 212 ft 6 in long between perpendiculars with a beam of 36 feet and a depth of hold of 21 feet. Extraordinary ingenuity and daring were shown by Count von Luckner, who converted the steel square-rigged Pass of Balmaha into an armed decoy vessel and sailed her half-way round the world during the war of 1914-18. His remarkable venture came to a surprising end. This chapter is by Lieut.-Com. E Keble Chatterton and is the second article in the series Mystery Ship Adventures. It is concluded in part 26. In this chapter the development of steam turbine engines is traced from the earliest known type to the modern geared turbines that propel the great ocean liners of to-day. The principle of the steam turbine was discovered 2,000 years ago by Hero of Alexandria. Three hundred years ago another type of turbine, working on the “impulse” principle, was invented by Giovanni Branca. Modern turbines are of either type, but generally they combine both of the principles involved and are known as impulse or impulse reaction turbines. It is to the genius of the Hon. Sir Charles Parsons that we owe the development of the modern steam turbine. This chapter is by F E Dean and is the seventh article in the series Marine Engines and Their Story. You can read more on Steam Turbine Construction and on Sir Charles Parsons in Wonders of World Engineering. This chapter explains how passengers and cargoes are booked by shipowners for their vessels, how cargo vessels may be chartered and how shipping conferences fix the charges for freight. The article is by Frank Bowen. The vessel shown in the full article is a Cargo Liner of the Short Sea Routes. She operates normally on behalf of the Cockerill Line between Ostend and Tilbury on a service which has been maintained between the two ports since June 1896. The cargo is such as to require rapid transit. The Amethyste is one of two twin-screw motor vessels built for this service. They are raised quarter-deckers of 278 tons deadweight, and 950 tons displacement on a 9 ft 6 in mean draught. This is the eighteenth article in the series on Merchant Ship Types. The remarkable growth of the Japanese Mercantile Marine in the nineteenth and twentieth centuries was caused by a number of economic circumstances that did not affect other maritime nations. Japanese cargo and passenger vessels, although not of the largest, are highly efficient. Dating in its modern form only from the ‘sixties of the last century, the Japanese Mercantile Marine may reasonably claim to be the newest in the world. The tonnage of its powered ships has increased at an amazing rate. This chapter is by Frank Bowen and is the third article in the series Sea Transport of the Nations. 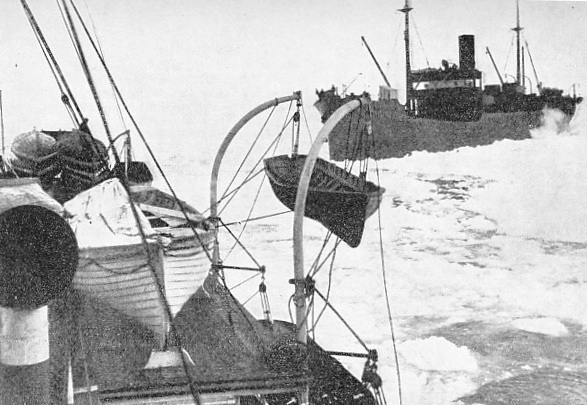 shore and the crews, numbering more than 1,000, were able to struggle across the ice to the shore. From the earliest times the stems of vessels have been decorated with some form of figurehead. Such adornments have fallen out of general use, but until comparatively recently the seaman attached great importance to the figurehead of his ship. In olden times the figurehead was considered to be of great importance by the forecastle hand, who looked upon it as a ship’s mascot. This feeling doubtless originated in the idea that a ship was almost a living thing, with a personality of her own, and that she should be given at least one symbol of this personality. The figurehead originated on the prow of the oared galley over the battering-ram. The bow of the galley was driven so hard against the enemy vessel to cause her to heel over. It became customary to adorn the prow with the head of a serpent or other fearsome beast, with the object of striking terror into the hearts of the slaves who rowed the enemy galleys. From these primitive figureheads gradually evolved the exquisite carvings which appeared on the bows of later vessels. This chapter is by Frank Bowen, and is illustrated with a beautiful colour plate (also reproduced on the cover of this week’s Part) showing the figurehead of the Cutty Sark.